Employess of GameBytes, makers of mobile games for Globe Telecoms, recently visited our feeding center in St. Benedict. 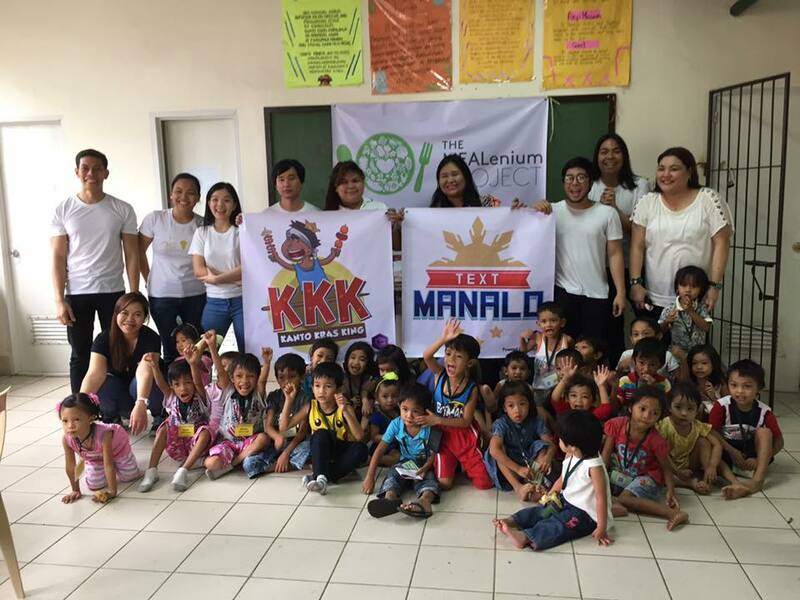 Aside from bonding with the children, they also brought educational materials and school supplies for the kids. A percentage of their mobile games revenue goes to The MEALenium Project. The more players who subscribe to their services, the bigger the donation fund grows. They are our major sponsor for the St. Benedict feeding center this year. Currently, they have 2 mobile games that benefit the children of The MEALenium Project. Kanto Kras King – The Philippine Street Food version of the widely popular game “Candy Crush Saga”. Players needs to swipe kanto food and connect rows or columns with at least three of the same kind to remove them from the board and reduce the number from the required kanto food. Text Manalo – Text Manalo Game Service is a fun mobile trivia game where in subscriber will be challenged to answer the questions from categories ranging from language, science, Pinoy Pop Culture, health, and more. « Now serving 1,000 meals a day!